It may not be a good idea to play Harvey's online slots for free with all the mouth watering symbols in the online slots game, which features 5 reels and 25 paylines. You can win a top real jackpot of $10,000 per spin and you do not have to be a high roller to play with a betting range from 1 cent up to $100. To practice this game and get the hang of it, check it out here with no download required. You will see a wild symbol, a scatter symbol, a multiplier, a bonus game, and also free spins. 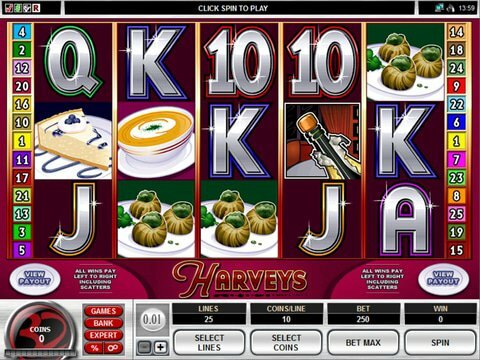 The delectable symbols in this free slot machine are a slice of cheesecake, shrimp, snails, a bowl of soup, champagne, Harvey himself, and the card symbols of 10 through A. Harvey is the wild and you can substitute the symbol for any other besides the scatter tea logo symbols to make a winning combination. The scatter tea logo symbols will award you from 2x to 100x your initial wager depending on how much you bet on that spin. Hit on 3 or more of the champagne symbols and you can win up to 30 free spins with a multiplier of 25x. The graphics in this free slot from Microgaming are nice and the sounds are quite soothing reminding of you the music you would hear in a high class restaurant. To be eligible to win the top real jackpot you must click the Bet Max button, which is located with the other betting control buttons at the bottom of the screen. Players from Canada can go to the Spin Palace Canadian Casino to play this free slot game. They will also give you 100% up to $1000 as a sign up bonus. That can total $2000 is gambling cash to get you started.